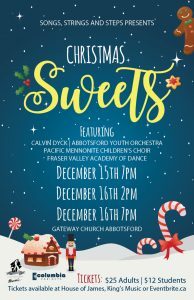 Fraser Valley Academy of Dance is proud to be performing once again as Calvin Dyck presents Christmas Sweets by Songs, Strings and Steps. Senior ballet students will be presenting excerpts from Act I and II of the Nutcracker, including Snow, Flowers, Arabian, Russian, Candy Canes, and Chinese. Purchase tickets at Eventbrite or at House of James or King’s Music. “Songs, Strings and Steps is an annual Christmas tradition in Abbotsford. This year’s production features a variety of local and professional artists in unique combinations. “Christmas Sweets” will involve a number of SWEETS and SUITES; sweets to eat as well as suites of carols and the famous Nutcracker Suite by Tchaikovsky. ​The entire first half of the show will feature excerpts from the Nutcracker Suite performed by a full orchestra and the renowned dancers from Fraser Valley Academy of Dance directed by John Carney. The plan is to place the orchestra on the floor and give the entire stage at Gateway Church to the dancers. The second half of the show will feature the Pacific Mennonite Children’s Choir, Michael Berg singing Casting Crowns’ version of “Sweet Little Jesus Boy” and the Abbotsford Youth Orchestra (along with professionals) playing some fresh, new arrangements of familiar carols as well as a choreographed version of “Jingle Bells” by Barrage. Janet Weston will be adding her creativity to help decorate the stage and foyer and Songs Strings and Steps is hiring professional sound and lighting techs to present the show. There will be costumes, and surprises for the audience, and of course some Christmas sweets to taste.